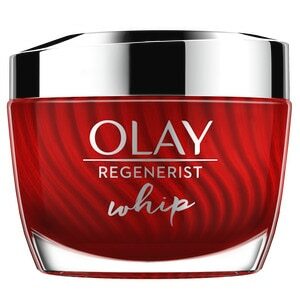 Olay Regenerist Whip delivers powerful wrinkle results without heaviness. This breakthrough facial moisturizer transforms from cream to liquid on contact for fast absorption and a breathable feel. You'll see skin that's smooth, matte and shine-free. Formulated with advanced Amino-Peptide Complex II, this anti-aging moisturizer actively hydrates to improve elasticity and firm skin for a lifted look, while diminishing the look of fine lines and wrinkles. Its innovative Active Rush Technology features a unique three-dimensional structure that transforms from cream to liquid on skin to deliver potent ingredients in an ultra-lightweight form. Forget about that sticky or greasy feeling, have it all with Regenerist Whip for powerful skincare with a light as air finish.